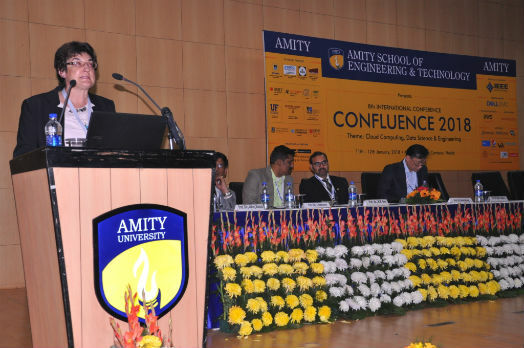 Noida: To abreast budding engineers about industry trends and new career opportunities, Department of Computer Science & Engineering, Amity School of Engineering and Technology (ASET) in association with DELL EMC Corporation started “Confluence 2018”- 8th International Conference on the theme “Cloud Computing, Data Science & Engineering” at Amity University Sector 125 Noida. The objective of the two day conference is to provide a common platform to Research Scholars, Scientists, Industrialists and Academicians to deliberate upon emerging trends and challenges faced by the industry and also to foster research relations between the Universities and the Industry. The conference witnessed the submission of more than 570 research papers across the globe including Australia, Germany, Sri Lanka, Denmark, Nepal, Spain, South Africa, China, Brazil, Taiwan and United Kingdom and participation of more than 500 Industry Heads, Foreign Delegates and students. After thorough screening, 158 manuscripts and research papers were selected for presentation. Welcoming the guest, Prof. (Dr.) Abhay Bansal, Jt Head, ASET and General Chair, Confluence 2018 said that cloud computing system is an emerging area in computing technology which supports processing of large volume of data as per on-demand service. He apprised that there is a huge demand for professionals with knowledge of Cloud Computing as most of the companies are implementing this technology. Dr. Bansal averred that this conference is an opportunity to discuss emerging trends and innovations and also to share research results to provide new directions in the field of next generation technologies. Addressing the gathering, Prof. (Dr.) Sunil Vadera, Professor, University of Salford, UK said that Cloud Computing brought a revolution in IT Industry and is expected to gain more momentum in the coming years. He shared that the annual demand for the fast-growing new roles of data scientist, data developers and data engineers will be very high. Dr. Vadera opined that before the development of a new technology, it is important to research on the practical and positive impact of its application on society, otherwise, it may not bring the desired change. He mentioned that further change in the industry will depend upon the learning of students and called upon them to studey the impact of application of new technologies. Prof. (Dr.) Maia Angelova, Professor, Melbourne Burwood Campus, Deakin University, Australia highlighted the importance of collaboration between interdisciplinary domains for advancement of technology for the benefit of mankind. Eminent academicians including prof. (Dr.) Shang Hong Lai, Director, NTHU, Taiwan; Prof (Dr.) Nen-Fu Huang, Dean, College of Electrical Engineering and Computer Science, National Tsing Hua, University, Taiwan; Prof. (Dr.) Keshav Dahal, University of the West of Scotland, UK and Prof. (Dr.) J Ramkumar, IIT Kanpur and Chairman IEEE UP Section were also present during the inauguration. During the two day conference, various technical symposia, keynote talks, panel discussions and workshop sessions will be conducted.